Beat da Beat is a new shoot em up from Nekki available for the iPhone, iPad, Windows Phone and Android platforms. This is a 2D spaceship shooting game in which players blast away alien spacecrafts with their own. Aliens have invaded and kidnapped your girl, and now you’ve got to rescue her! Beat da Beat is not your typical 2D blast em up. This game has the added novelty of gameplay generated by its soundtrack. This means that its dubstep music is also an in-game mechanic. 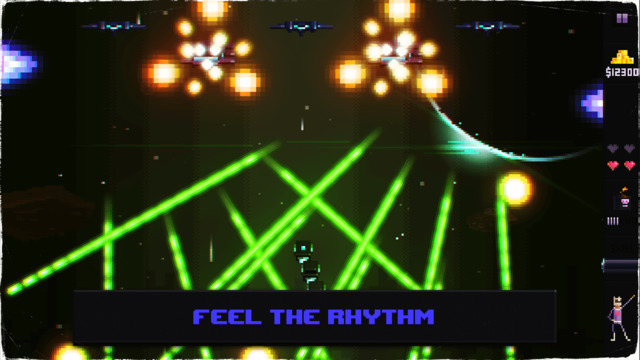 The alien spaceships fire their laser beams and bullets to match the beat and rhythm of the music. 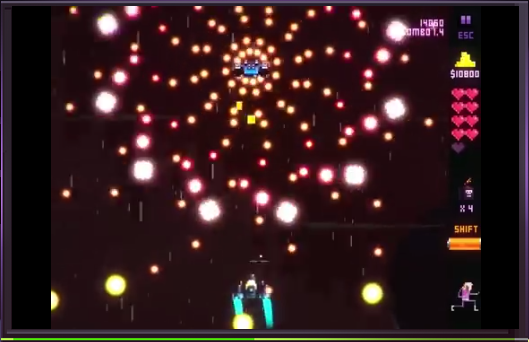 Players must dodge their way through a plethora of multicolored bullets by moving their spacecraft in any direction. The game has eight stages for players to blast their way through, and those include four alternative bosses to take on. Furthermore, it also includes customizable spaceships that players can upgrade by collecting coins in the game. Players can purchase new, stronger spacecrafts or enhance their existing ships; and the best thing is there are no requirements for any in app purchases to do so. The game has pixellated graphics. It does not have especially smooth visuals, but the multicolored bullets do add a lot of color and extra lighting effects to Beat da Beat. The game has a great soundtrack, but the in-game sound effects are a little limited to crumpled explosions and beeping bullets. The game has intuitive and responsive controls and a slow-motion mechanic triggered by removing your finger from screen. That comes in handy when the bullets are really flying, and you can then also select to further extend the slow motion or set off a bomb. Overall, Beat da Beat is a fun, and novel, shoot em up that will give fans of the genre something to chew on. Its graphics are not the smoothest, and it is a little short on variety as the various stages are much the same. It is not a free app, but at $0.99 still offers good value. You can find further details at the Beat da Beat website.